Fluid flow velocity in physics can be found on the principle of venturi meter. The Fluid flow concept is easy to understand if visualized. We need a learning media of fluid velocity, so the concept can understanding. Design of this tool aims to help students understand the fluid flow velocity. Data is taken automatically by Arduino-based water flow sensor, with speed change at the speed knop. Based on the design result of the tool which can be obtained by measuring the fluid flow velocity at a speed greater than 0.36 m/s, and proved by graph analysis logarithmic between velocity values of magnitude theory (Vtheory = 0.5x + 0.7934 m/s ) and tool speed (Vtool = 0.5825x + 1.129 m/s). The speed difference between the theory and the tool indicates the magnitude of the frictional speed due to the turbulent flow. So it can be concluded the design of this tool can be used as a learning media to help students in understanding the topic of fluid. Arsyad, A. (2009). Media pembelajaran. Jakarta: PT Raja Grafindo Persada. Ayub, M. S. A. (2015). Perancangan dan penerapan apurtus pengukuran debit air dengan menggunakan venturimeter dan water flow sensor. Jurnal Inovasi Fisika Indonesia, 4(2), 21–26. Azhari, A.. & Soeharwinto (2015). Perancangan sistem informasi debit air berbasis Arduino Uno. Jurnal Singuda Ensikom, 13(36) , 89–95. Musfiqon (2012). Pengembangan media & sumber pembelajaran. Jakarta: Prestasi Pustaka. Pramesty, R. I., & Prabowo. (2013). Pengembangan alat peraga kit fluida sebagai media pembelajaran pada sub materi fluida statis di kelas XI IPA SMA Negeri 1 Mojosari Mojokerto. Jurnal Inovasi Pendidikan Fisika, 2(3), 70–74. Ramadhan, Y., Ramelan, & Sumbodo, W. (2014). Pengembangan media pembelajaran pengukuran rugi aliran fluida cair dalam pipa venturi untuk menunjang perkuliahan mekanika fluida. Journal of Mechanical Engineering Learning, 3(2), 11 –124. Roestiyah, N. K. (2012). Strategi Balajar Mengajar. Jakarta: Renika Cipta. 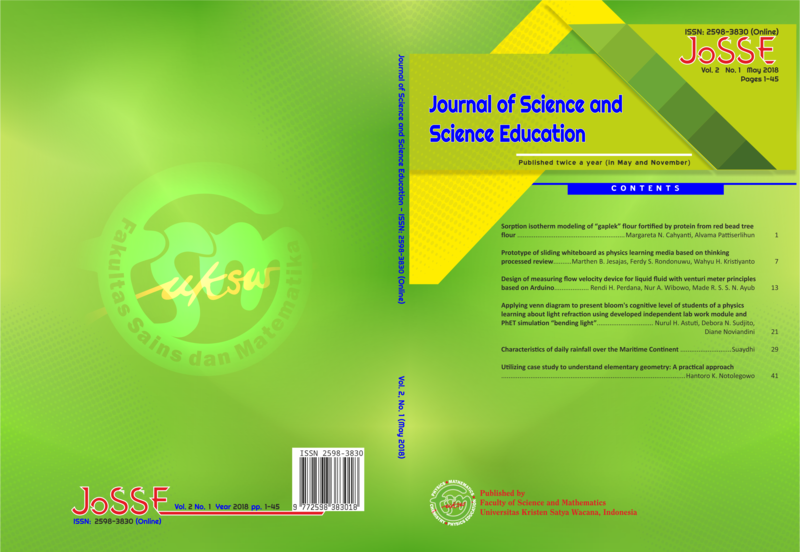 Setyowati, V., Muninggar, J., & Ayub, M. R. S. S. N. (2017). Design of heart rate monitor based on piezoelectric sensor using an Arduino. Journal of Physics: Conf. Series, 795(1), 1–7. Sutarto, & Indrawati. (2010). Strategi Belajar Mengajar “Sains”. Jember: UPT Penerbit UNEJ.